As things settle down (a month and a half in), the weeks get a little less crowded and my blogs might start being a little less often. Especially as I don’t bring my camera to some activities, such as a trail ride on horseback in the desert. An extremely fun part of the week, but difficult enough with two hands free. Halloween isn’t celebrated in Israel, but at the mahon we had our own little Halloween party with a few people dressing up, a chocolate rice krispie treat, and Hocus Pocus. As per usual I did head out to hike twice this week, on one of my journeys I headed down a path I knew about, but hadn’t yet explored. It’s called fossil canyon, and rightly so! 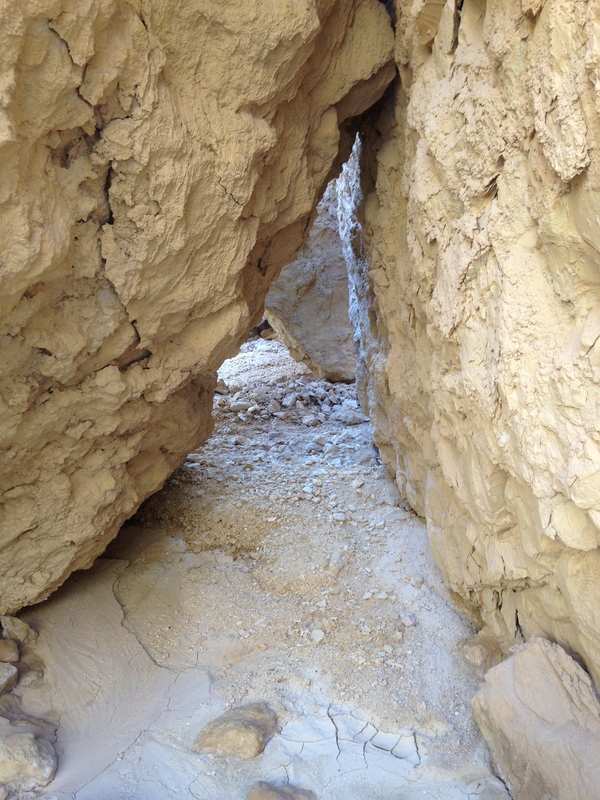 I found three canyons on my adventure and saw the coolest little tunnel at the end of the wadi (pictured below). The weekend leading up to my birthday was spent on a three day trip through the Negev desert wit the theme of “Environmental Justice.” We learned about issues surrounding bedouin tribes in the Negev, Jewish settlements, and other types of communities attempting to coexist as well as how the presence of these communities affects the environment of the Negev desert. It was an incredible trip that was reminiscent of the trip I took last year with The Olive Tree Initiative, with a slightly different focus. The rhythm of having 4-5 meetings per day and constantly asking questions, however, was very familiar. 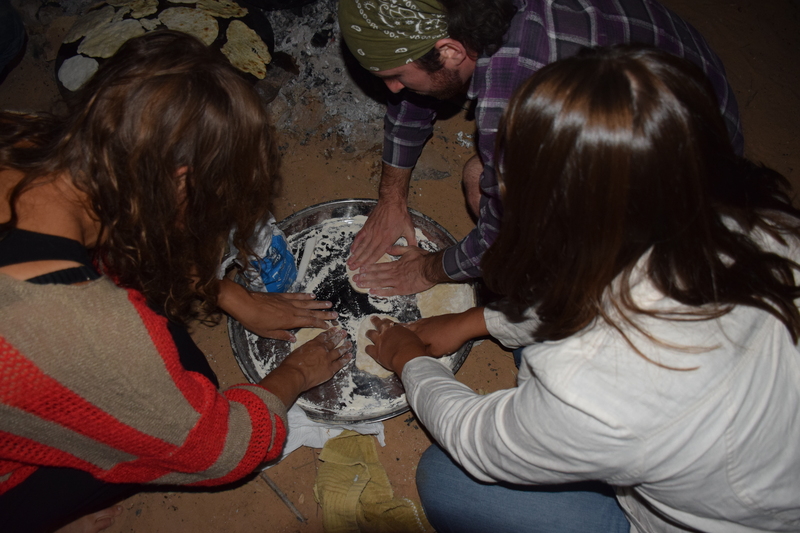 I learned so much over the past three days that I feel I have a much firmer grasp on the political issues surrounding the desert and the traditions of the bedouins, a subject that has long interested me. 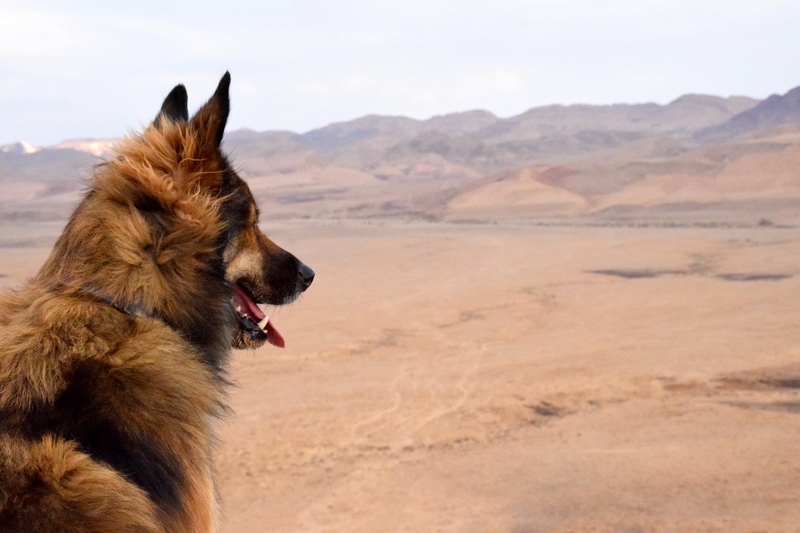 A dog that joined us on our hike down the Mizpe Ramon Crater. 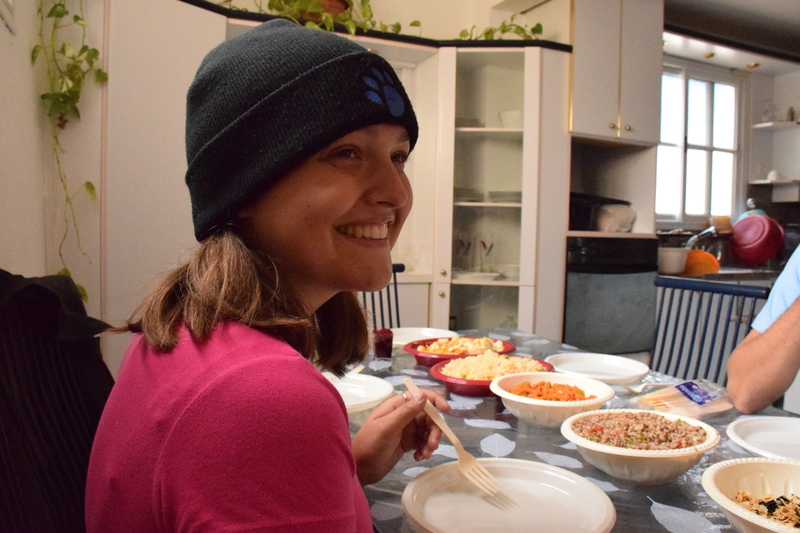 We ate lunch at the house of members of the Black Hebrews, an all vegan community, with their own spiritual values and culture. Some of which is carried over from the US (where most of them originated from). It was nice to hear familiar accents and be in a house that easily could have been in the Midwest. The small town of Mizpe Ramon had a nice little shopping area with secondhand stores and an organic food store. In some ways it felt like downtown Sebastopol, just a lot less developed. 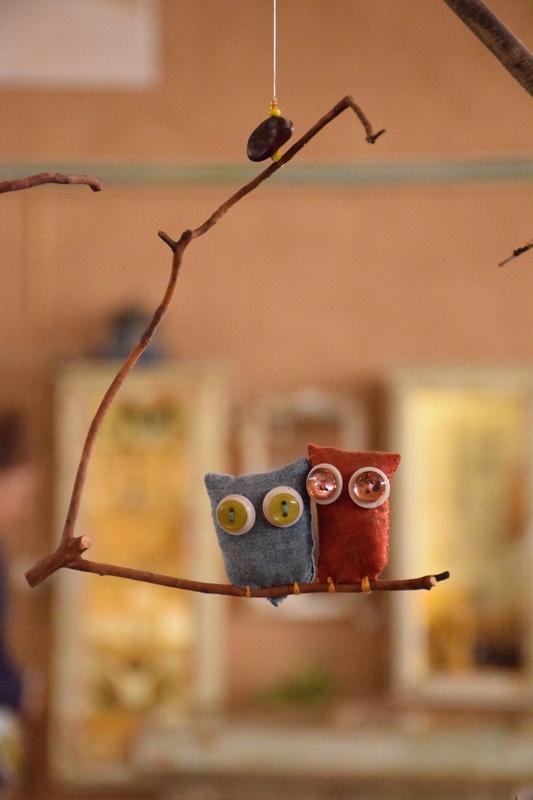 These darling little owls were in an organic grocery store/coffee shop. 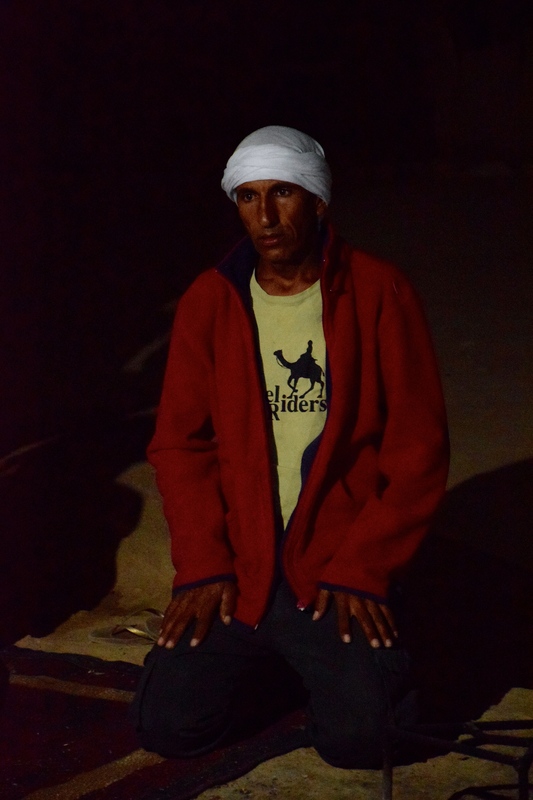 We spent the night in a small bedouin village, our host’s name was Salman and had a fascinating story about his life as a bedouin and his views for the future of his village. The bedouin village of Wadi Al Na’am (not Salman’s village) is located across the street from an industrial park that includes many waste hazard disposal companies. The presence of the facilities has caused the death of many sheep and horses in the village as well as many miscarriages among the women. 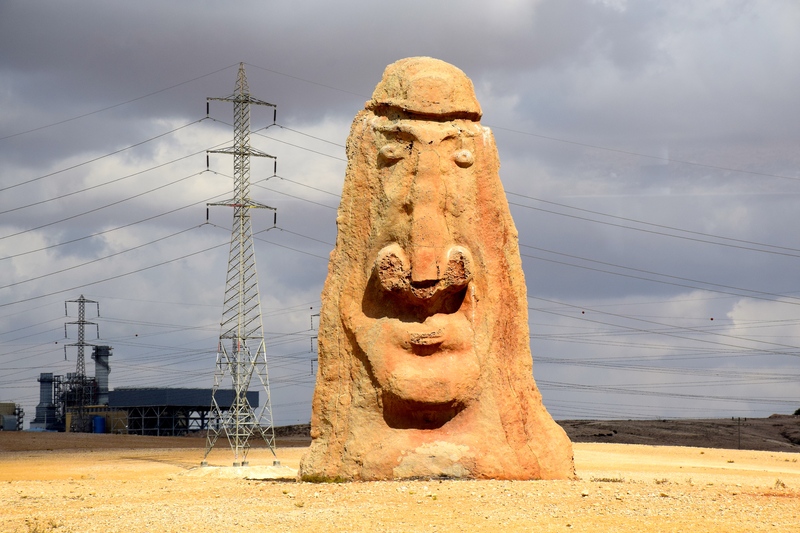 This statue of a bedouin man was erected just outside the village to remind the companies that there are still people there and that they are watching them. 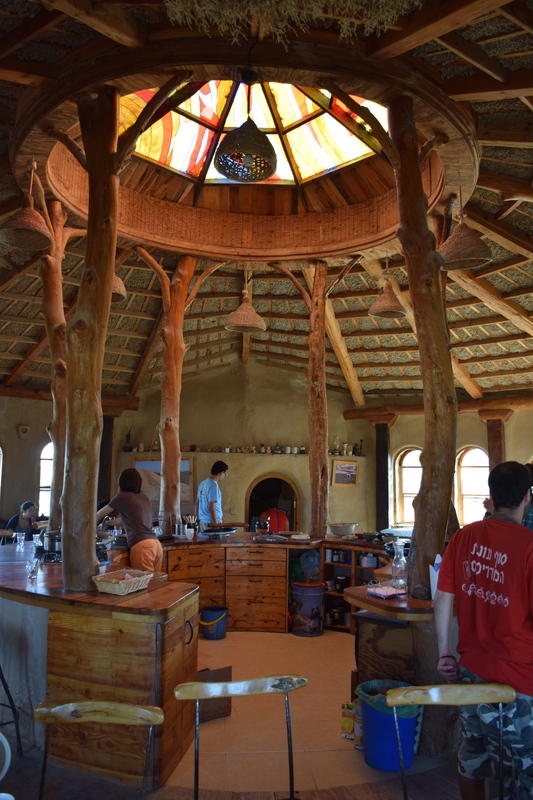 We also spent one night at Rodni’s house, he created his house using all reused materials and mud. His design for the house was inspired by the desert with rounded roofs to mimic the nearby hilltops and underground rooms that echo the holes that many of the desert rodents make to live in. He realized there aren’t many straight lines in nature and tried to mirror that in his house with round doors and windows, and even a circular kitchen. Upon first arriving, I definitely felt as though we were visiting a hobbit house! We had a poyke dinner at Rodni’s house near the tent we all stayed in. We also helped make home made pita! #datkibbutzlyfe: It takes and village to raise a child, and to marry one as well! Or at least, that’s how the kibbutz does it! Having never been to a wedding before the kibbutz wedding, I can’t necessarily say that this is different from all of the other weddings I’ve been to, or sort out the differences, but from asking around I got the sense that some parts of the wedding were unique to the kibbutz. 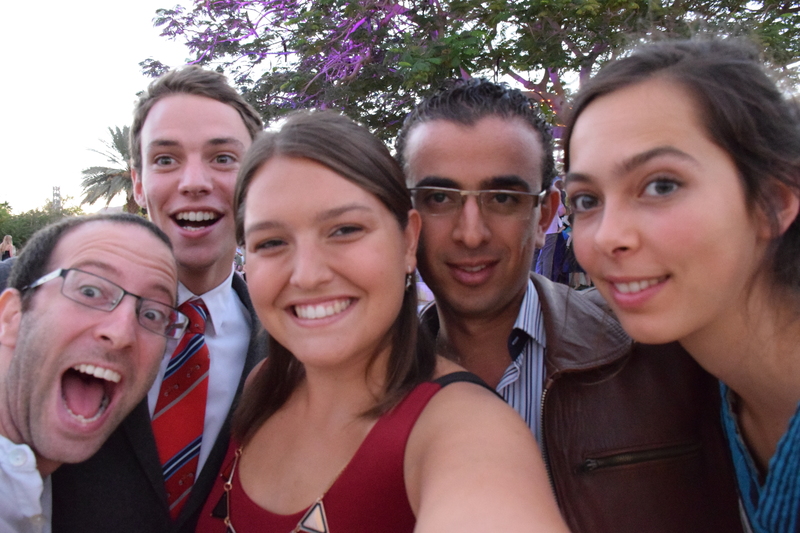 The wedding planner was a woman from the kibbutz and her team was everyone on the kibbutz. The bride and groom met with her to sort out what food they wanted and request a “desert theme” in the dining room. And, although they had a little bit of a hand in the choice of music, their first dance, their dress and suit respectively, most of the wedding was planned and put together by members of the kibbutz with exact decorations kept secret. They’ve been planning the wedding for quite awhile but the past week the kibbutz has slowly transformed into the perfect scene for a wedding. Two days before the wedding, everyone went into high gear (including the students) and we helped sweep the patio outside the dining room, set up lights where the ceremony and dance party would be, rearrange the dining room to provide places for the bride and groom and change all of the decorations. The decorating committee had decided to follow the desert theme by decorating the “Chupah” with light blue tool and the tables with gold or white table cloths and center pieces of candles in sand, succulent plants, small white flowers and some rocks that looked suspiciously familiar from my hikes. Setup was finally completed half an hour before the wedding began and I rushed to change into my dress for the wedding. It began with a reception with food, lemonade and good company as the sun began to set over the mountains. People began to congregate, and stand around the chupah. There were a few seats lining the aisle but not nearly enough to accommodate the whole kibbutz (I asked about the reason for so many standing people and was told this is an Israeli tradition). The chupah, under which the happy couple were married was elevated so everyone could see and had four people holding a cloth suspended over the bride and groom (I attribute this to the fact that the wedding also had some jewish customs). My PA made her way down the aisle, preceded by two flower girls and a flower boy, accompanied by her parents while we all watched from the sidelines. 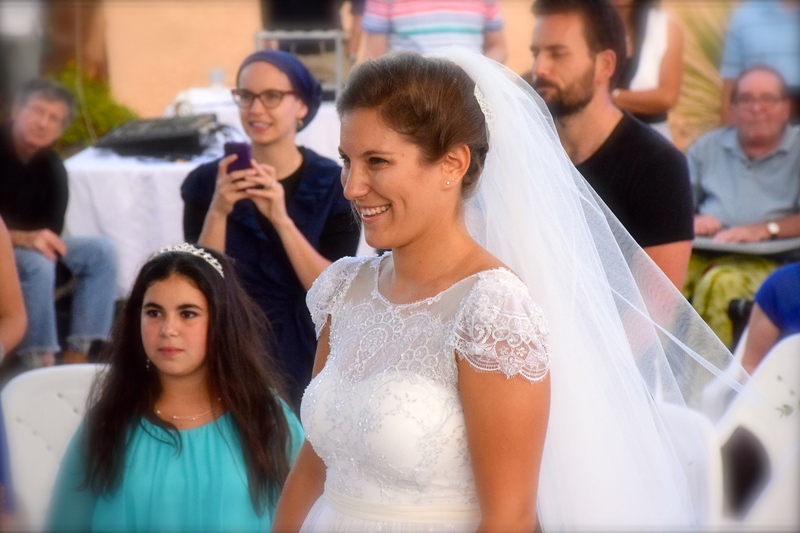 They said their vows, one in Hebrew, one in English, each speaking in the other’s native tongue which also allowed for the entire audience to understand the vows since a few of us were not fluent in both english and hebrew (mostly the Arava students). Rings were exchanged, a glass was stomped on, and there was a kiss, all common traditions for weddings, American and/or Jewish. From there, we had a dance party until dinner while the bride and groom drove off in their “just married” golf cart, adorned with balloons and cans for some peace and quiet until dinner. The students were the last dancing and finally left the dance floor when the DJ played a saxophone solo that was clearly a message that we all needed to go eat. No speeches were made during dinner, instead we all ate and chatted happily, because of our late arrival we sat at a table outside on the grass. After everyone had eaten, the cake was cut and we all had desserts near the merkaz (there wasn’t enough cake for everyone). Luckily the desserts they made for us were delicious, miniature cheesecakes, chocolate mousse and delicious chocolate chip cookies. After we had eaten our share of dessert, everyone gathered once again around the stage and speeches and videos began. The families had created a slideshow of photos and music showing Matan and Kate growing up, meeting and then dating for seven years. All of the new in-laws spoke, telling stories of their children and congratulating them. One was a storyteller and told a wonderful story about laughter that I appreciated more than most of the other speeches. I love storytellers. After the in-laws had all spoken, the bride’s cousin stood and sang a song, then members of the kibbutz, led by the groom’s mother and joined by the kibbutz choir, sang some numbers they had put together (including “You Can’t Take That Away From Me”). The students gave their own speech, congratulating the bride and groom and expressing our gratitude for having the bride as our PA. A painting was presented to them that was passed along to all of the marriages of sons and daughters of the kibbutz and those who get married on the kibbutz. The painting was created years ago by a member of the kibbutz, it is a tree with the familiar Arava mountains in the background. On each of the branches of the tree are the names of the couples and the date they were wed. It was a beautiful gift to be passed along to the next couple after them. Finally, the couple’s friends performed a short skit they had created and played their own video where they had created a parody of “Rude” by Magic and added some pictures of the couple’s time together. The beautiful thing about this whole part (in my opinion) was that it was a complete surprise for both of them what they were going to see. It was a beautiful thing, watching the whole community come together to make this the most special day for these two and give them a gift from the kibbutz. In addition, having everyone work on the wedding made the wedding belong to each person on the kibbutz as well. After this part, the bride and groom had their official first dance which turned into a second dance party with an open bar. This went on late into the night as everyone continued celebrating.